Here is a picture of the Palino Pimps vs. Punk in Drublic. This picture was taken at the fabulous 2nd Annual (Invitational?) Dogfish Head Intergalactic Bocce Tournament. This was a 16 team bracket double-elimination tournament. It took place over two 10 hour days. Unfortunetly, since I was occupied, I could not attend last year. And because of that, I missed out on this years play. The teams from last year were invited back first. Anyway, Robert and I decided to see if we could “stop by” on the second day and maybe hang-out for a bit. Surprised, we felt as though we were totally welcomed. All of the players were very nice and hilarious, the employees that were that were being very cool towards us, and even the owner of the company personally came over to us and told us to make ourselves at home – awesome. So a couple of hours of “stopping by” turned into all day hanging out. We then left the brewery to head to the brew pub to try the brew pub exclusive Fed Extra Mild. This beer was really anything but mild at over 6% and really nicely hopped. While we were standing at the bar, one of the employees asked us to come upstairs to the private bocce party, where we thouroughly enjoyed ourselves. 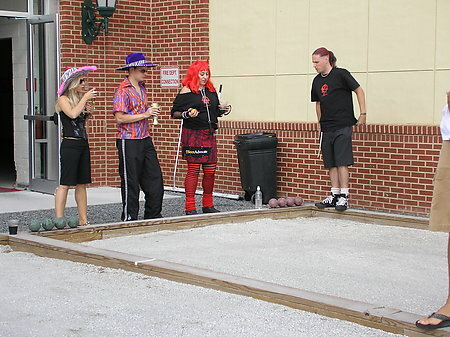 So next year at the bocce tournament look out because if you have a problem – if no one else can help – and if you can find them – maybe you can play bocce with : The B-Team. This entry was posted on Saturday, September 23rd, 2006 at 12:00 am	and is filed under Uncategorized. You can follow any responses to this entry through the RSS 2.0 feed. You can leave a response, or trackback from your own site.